Would you pay £85 to walk someone elses dog for an hour? 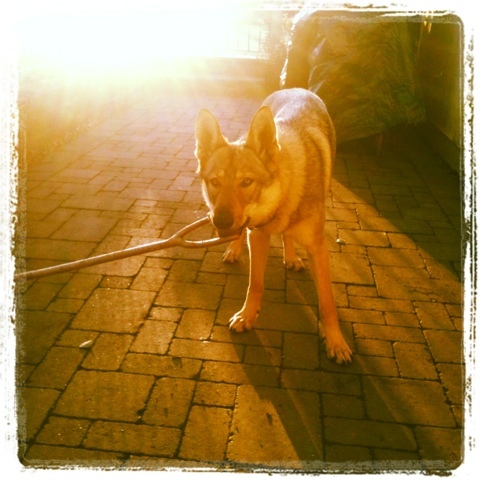 Tuchena is a ‘Wolfdog’, (predominantly Czechoslovakian wolfdog, but there is also a bit of Saarloos in her too). The Czechoslovakian wolfdog is relatively new in the scheme of things, having been first bred in 1955 by crossing a Carpathian (not Timber) wolf with a German Shepherd with the aim of creating a dog with the obedience of a GSD and the size, speed and stamina of a wolf. The result of this was a dog that looks very much like a wolf. Tuchena is tall, long, lean, quick, intelligent and weighs approx. 37kg (81 pounds). She has a thick dense coat that covers her entire body, beautiful mask markings on her face which almost form a zig-zag pattern, a dark saddle and a thick tail that reminds me of Basil Brush….Boom Boom! She has a completely black nose, lips and ‘eye-liner’ with a long dainty muzzle. She stands with her front legs slightly splayed and has all black paw pads and nails. Her amber eyes are intensely intelligent. Her ears on the other hand give her away as having GSD in her breed, although they are quite furry and extraordinarily expressive they are larger than a wolves ear and more pointed. But, however ‘wolf’ like in appearance she might be she is still a wolfdog. Legal to own in this country as a domestic pet with no special licensing or registration required (just patience and a great deal of time!). She also has certain personality traits that make her more ‘wolf like’ than ‘dog like’ in her behaviour, but she is not a wolf. Yesterday I came across this article on the internet that left me speechless…well only for a short while obviously, because here I go…… It appears that this guy and his mum paid £85 each to spend an hour with two wolfdogs thinking they were wolves. Initially I was angry at him for the article, with photos (lovely as they are) labelled as ‘wolf’, ‘up close and personal with a wolf’ and the most outrageous ‘North American Timber Wolf on a Lakeland Fell’……um, hello wouldn’t alarm bells start going off in most people’s heads now??? Wolves can be owned in this country under strict licensing and registration controls, but they must be captive, you can’t take your pet wolf for a walk!! It wasn’t just myself that saw and was stunned by the article, there were at least 11 comments on it last night. I also commented, but it never got published and now all of the comments have now been removed. All of the comments, including one from the breeder of the wolfdogs were all pointing out the misrepresentation in the article. I checked out the link to ‘Predator Experience’ that is posted at the bottom of the article and my anger shifted to them. Nowhere on their web page do they mention that these are wolfdogs, the continually refer to them as ‘Timber Wolf Origin Pups’ and the ‘experience’ is called ‘Walking with Wolves’. They also have a Facebook page where they do not appear to be correcting anyone who calls them wolves to the fact that they are not. Looking forward to todays meeting with Cunninghams in Ambleside, to discuss future sponsorship agreement plans. It’s an exciting relationship we are proud to be part of. If you want to spend £85 of your hard-earned cash walking someones pet dog, then that is your choice, however you should know what you paying for. If you think you are spending time in the presence of a wolf, I am afraid you are sadly mistaken and should ask for a refund. 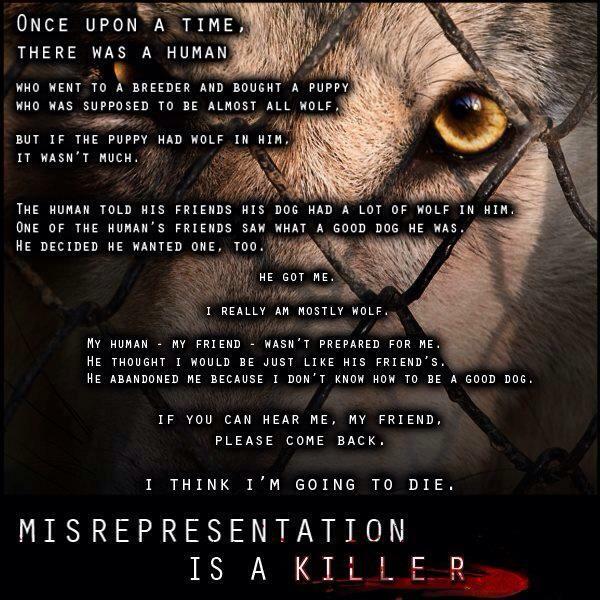 Misrepresentation of any breed of dog is dangerous. People need to know exactly what they are dealing with, so put your ego’s aside for 5 minutes and think of the dog and its reputation first. 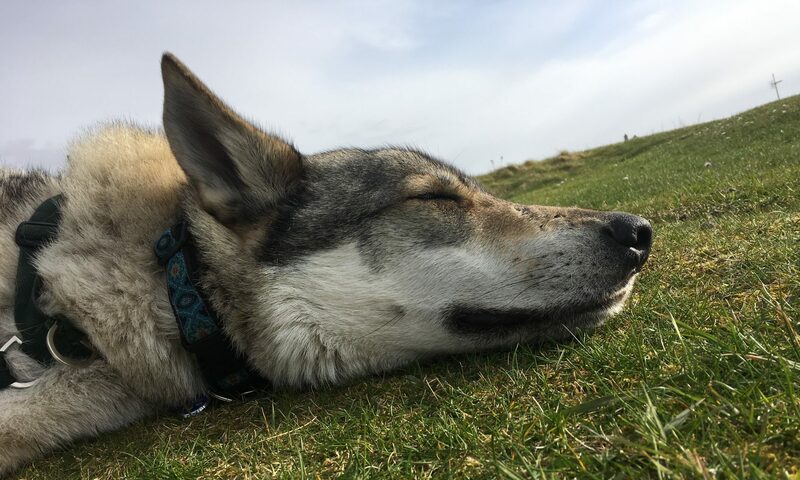 Just to clarify – Huskys, Malamutes, Northern Inuits & Utonagans are not wolfdogs and have no wolf content. Wolfdog refers to Czechoslovakian Wolfdogs and Saarloos. I went to their Facebook page and posted all over it that they were taking people’s money for nothing. I’ll probably get put in Facebook jail for spam or something, but hopefully someone will take notice. I did a bit of research into this. On their main website they do state in the terms and conditions that they are not actually wolves. I still think this is pretty disgusting though. Telling people that they are wolves and charging £85 to spend an hour with them. Not many people will be hunting through the T&Cs for this information.